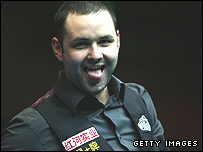 Stephen Maguire potted a memorable 147 as he battled his way past Ryan Day to reach the China Open final. The Glaswegian held his nerve to clinch a dramatic 6-5 victory over Welshman Day, winning the match on the blue in a final-frame decider. But it was in the second frame that the Scot wrote his name into the record books with the first-ever clearance in a ranking event in Asia. He now faces Shaun Murphy after the Englishman's 6-3 win over Mark Selby. It was not plain sailing for Murphy, who battled back from 3-2 behind to beat compatriot and this season's Masters and Welsh Open winner Selby at the Beijing Sports Gymnasium. Selby pocketed breaks of 54, 95 and 132 for a 3-2 lead, but saw Rotherham professional Murphy progress to the final thanks to breaks of 64, 73 and 77.
Who do you think will win the China Open? "I'm very pleased to win and to be in the final," said Murphy. "Now I've got the chance to win a trophy. "I showed a lot of patience tonight. Mark is a fantastic player but I decided to hang back and wait for him to make the mistakes." A disappointed Selby reflected: "I struggled throughout the match, apart from one frame. Shaun wasn't brilliant either but he deserved to win." Murphy may have to up his game against Maguire, whose maximum was the second of his career - the first coming in the Scottish Open in 2000. His 147, the 38th in a ranking event and the fifth of the season, will earn him an additional £22,000 in prize money if it is not matched. Maguire, who fought back from 4-2 down to beat Day, has now secured his passage to three ranking-event finals this season, including the Maplin UK Championship. "It was a good match to be involved in," he said. "It was obviously a bit tense at the end, so it was good to get over the line. "It was brilliant to get a 147. Apart from winning tournaments it is the best feeling ever. They don't come along very often, so I'll have to savour this moment for as long as possible." Shanghai Masters champion Day was understandably annoyed having come within a frame of reaching back-to-back finals in China. He admitted: "We both had a run of a few frames but I had a chance to clear up at the end so I'm a little disappointed, especially as I played quite well."